The Japanese yen has started off the week with considerable gains, as USD/JPY trades at the 113 line in the European session. In economic news, Japanese Retail Sales disappointed with a decline of 0.1%. However, manufacturing and housing numbers both beat their estimates. In the US, there are just two US releases – Chicago PMI and Pending Home Sales. On Tuesday, the US releases ISM Manufacturing PMI. The week started off on a sour note in Japan, as Retail Sales came in at -0.1%, marking its third decline in four releases. This points to weaker consumer spending, as Japanese consumers are tightening their wallets in response to a weak economy. There was some positive news as well, as Preliminary Industrial Production posted a strong gain of 3.7%, while Housing Starts rebounded with a gain of 0.2%. Both indicators exceeded expectations. 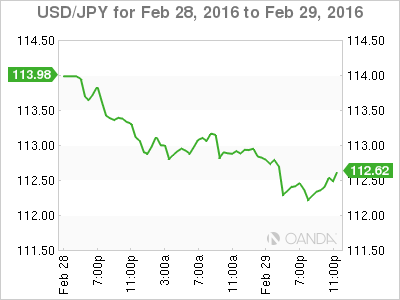 It’s been an outstanding February for the Japanese currency, which has surged 6.8% against the US dollar this month. Despite the limping Japanese economy, the yen has taken full advantage of its traditional safe-haven status, as global financial turmoil has caused investors to flee risk and snap up safe assets like the yen. At the same time, soft fundamentals are likely to continue, and the BOJ may have to take further monetary action at its next policy meeting in March. At the January policy meeting, the BOJ adopted negative interest rates, shocking the markets and sending the yen sharply lower before the currency rebounded. If the BoJ does take action at the next policy meeting, this would likely push the yen to lower levels. The US economy has had a slow start to 2016, with soft growth and employment numbers in comparison with the red-hot numbers which characterized the second half of 2015. One sector which has been struggling badly is the manufacturing industry. The US economy has been grappling with a downturn in global demand, which has taken its toll on the export and manufacturing sectors. A strong US dollar, which has posted broad gains in recent months, has only exacerbated the situation. However, there was some positive news late in the week. US Preliminary GDP posted a strong gain of 1.0%, well above the estimate of 0.4%. There was also positive news from the manufacturing sector, as durable goods sparkled. Core Durable Goods rose 1.8%, crushing the estimate of 0.2%. This marked the key indicator’s strongest showing since March 2014. Durable Goods Orders followed suit with a sharp rise of 4.9%, rebounding from the previous reading of -5.1%. This was stronger than the estimate of 3.0%. Meanwhile, housing numbers have not impressed, as New Home Sales slipped to 494 thousand in January, compared to 544 thousand a month earlier. This figure was well short of the estimate of 522 thousand. Pending Home Sales will be released later on Monday, with the markets expecting a gain of 0.6%. If this housing release also misses expectations, the US dollar could respond with losses. In the USD/JPY ratio, long positions retain a strong majority (63%), which is indicative of strong trader bias towards the pair breaking reversing directions and moving higher.